This article is about scheduling in operating systems generally. For networks, see Network scheduler. For other uses, see Scheduling (disambiguation). In computing, scheduling is the method by which work is assigned to resources that complete the work. The work may be virtual computation elements such as threads, processes or data flows, which are in turn scheduled onto hardware resources such as processors, network links or expansion cards. 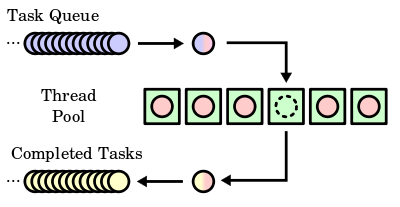 A scheduler may aim at one or more of many goals, for example: maximizing throughput (the total amount of work completed per time unit); minimizing wait time (time from work becoming enabled until the first point it begins execution on resources); minimizing latency or response time (time from work becoming enabled until it is finished in case of batch activity, or until the system responds and hands the first output to the user in case of interactive activity); or maximizing fairness (equal CPU time to each process, or more generally appropriate times according to the priority and workload of each process). In practice, these goals often conflict (e.g. throughput versus latency), thus a scheduler will implement a suitable compromise. Preference is measured by any one of the concerns mentioned above, depending upon the user's needs and objectives. The long-term scheduler, or admission scheduler, decides which jobs or processes are to be admitted to the ready queue (in main memory); that is, when an attempt is made to execute a program, its admission to the set of currently executing processes is either authorized or delayed by the long-term scheduler. Thus, this scheduler dictates what processes are to run on a system, and the degree of concurrency to be supported at any one time – whether many or few processes are to be executed concurrently, and how the split between I/O-intensive and CPU-intensive processes is to be handled. The long-term scheduler is responsible for controlling the degree of multiprogramming. The short-term scheduler (also known as the CPU scheduler) decides which of the ready, in-memory processes is to be executed (allocated a CPU) after a clock interrupt, an I/O interrupt, an operating system call or another form of signal. Thus the short-term scheduler makes scheduling decisions much more frequently than the long-term or mid-term schedulers – a scheduling decision will at a minimum have to be made after every time slice, and these are very short. This scheduler can be preemptive, implying that it is capable of forcibly removing processes from a CPU when it decides to allocate that CPU to another process, or non-preemptive (also known as "voluntary" or "co-operative"), in which case the scheduler is unable to "force" processes off the CPU. First in, first out (FIFO), also known as first come, first served (FCFS), is the simplest scheduling algorithm. FIFO simply queues processes in the order that they arrive in the ready queue. This is commonly used for a task queue, for example as illustrated in this section. Earliest deadline first (EDF) or least time to go is a dynamic scheduling algorithm used in real-time operating systems to place processes in a priority queue. Whenever a scheduling event occurs (a task finishes, new task is released, etc. ), the queue will be searched for the process closest to its deadline, which will be the next to be scheduled for execution. Job shop scheduling – there are n jobs and m identical stations. Each job should be executed on a single machine. This is usually regarded as an online problem. Open-shop scheduling – there are n jobs and m different stations. Each job should spend some time at each station, in a free order. Flow shop scheduling – there are n jobs and m different stations. Each job should spend some time at each station, in a pre-determined order. Mac OS 9 uses cooperative scheduling for threads, where one process controls multiple cooperative threads, and also provides preemptive scheduling for multiprocessing tasks. The kernel schedules multiprocessing tasks using a preemptive scheduling algorithm. All Process Manager processes run within a special multiprocessing task, called the "blue task". Those processes are scheduled cooperatively, using a round-robin scheduling algorithm; a process yields control of the processor to another process by explicitly calling a blocking function such as WaitNextEvent. Each process has its own copy of the Thread Manager that schedules that process's threads cooperatively; a thread yields control of the processor to another thread by calling YieldToAnyThread or YieldToThread. macOS uses a multilevel feedback queue, with four priority bands for threads – normal, system high priority, kernel mode only, and real-time. Threads are scheduled preemptively; macOS also supports cooperatively scheduled threads in its implementation of the Thread Manager in Carbon. 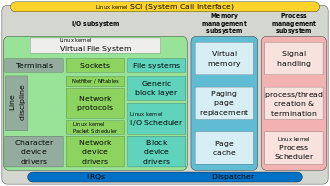 In Linux 2.4, an O(n) scheduler with a multilevel feedback queue with priority levels ranging from 0 to 140 was used; 0–99 are reserved for real-time tasks and 100–140 are considered nice task levels. For real-time tasks, the time quantum for switching processes was approximately 200 ms, and for nice tasks approximately 10 ms. The scheduler ran through the run queue of all ready processes, letting the highest priority processes go first and run through their time slices, after which they will be placed in an expired queue. When the active queue is empty the expired queue will become the active queue and vice versa. Con Kolivas' work, most significantly his implementation of "fair scheduling" named "Rotating Staircase Deadline", inspired Ingo Molnár to develop the Completely Fair Scheduler as a replacement for the earlier O(1) scheduler, crediting Kolivas in his announcement. CFS is the first implementation of a fair queuing process scheduler widely used in a general-purpose operating system. Solaris uses a multilevel feedback queue with priorities ranging between 0 and 169. Priorities 0–59 are reserved for time-shared threads, 60–99 for system threads, 100–159 for real-time threads, and 160–169 for low priority interrupts. Unlike Linux, when a process is done using its time quantum, it is given a new priority and put back in the queue. Solaris 9 introduced two new scheduling classes, namely fixed priority class and fair share class. The threads with fixed priority have the same priority range as that of the time-sharing class, but their priorities are not dynamically adjusted. The fair scheduling class uses CPU shares to prioritize threads for scheduling decisions. CPU shares indicate the entitlement to CPU resources. They are allocated to a set of processes, which are collectively known as a project. ^ C. L., Liu; James W., Layland (January 1973). "Scheduling Algorithms for Multiprogramming in a Hard-Real-Time Environment". Journal of the ACM. ACM. 20 (1): 46–61. doi:10.1145/321738.321743. We define the response time of a request for a certain task to be the time span between the request and the end of the response to that request. ^ Kleinrock, Leonard (1976). Queueing Systems, Vol. 2: Computer Applications (1 ed.). Wiley-Interscience. p. 171. ISBN 047149111X. For a customer requiring x sec of service, his response time will equal his service time x plus his waiting time. ^ Feitelson, Dror G. (2015). Workload Modeling for Computer Systems Performance Evaluation. Cambridge University Press. Section 8.4 (Page 422) in Version 1.03 of the freely available manuscript. ISBN 9781107078239. Retrieved 2015-10-17. if we denote the time that a job waits in the queue by tw, and the time it actually runs by tr, then the response time is r = tw + tr. ^ Silberschatz, Abraham; Galvin, Peter Baer; Gagne, Greg (2012). Operating System Concepts (9 ed.). Wiley Publishing. p. 187. ISBN 0470128720. In an interactive system, turnaround time may not be the best criterion. Often, a process can produce some output fairly early and can continue computing new results while previous results are being output to the user. Thus, another measure is the time from the submission of a request until the first response is produced. This measure, called response time, is the time it takes to start responding, not the time it takes to output the response. ^ Paul Krzyzanowski (2014-02-19). "Process Scheduling: Who gets to run next?". cs.rutgers.edu. Retrieved 2015-01-11. ^ Sriram Krishnan. "A Tale of Two Schedulers Windows NT and Windows CE". Archived from the original on July 22, 2012. ^ "Windows Administration: Inside the Windows Vista Kernel: Part 1". Technet.microsoft.com. 2016-11-14. Retrieved 2016-12-09. ^ a b "Technical Notes". Developer.apple.com. Retrieved 2016-12-09. ^ "Guides and Sample Code". Developer.apple.com. Retrieved 2016-12-09. ^ Molnár, Ingo (2007-04-13). "[patch] Modular Scheduler Core and Completely Fair Scheduler [CFS]". linux-kernel (Mailing list). ^ Tong Li; Dan Baumberger; Scott Hahn. "Efficient and Scalable Multiprocessor Fair Scheduling Using Distributed Weighted Round-Robin" (PDF). Happyli.org. Retrieved 2016-12-09. ^ a b "Comparison of Solaris, Linux, and FreeBSD Kernels" (PDF). Archived from the original (PDF) on August 7, 2008. Błażewicz, Jacek; Ecker, K.H. ; Pesch, E.; Schmidt, G.; Weglarz, J. (2001). Scheduling computer and manufacturing processes (2 ed.). Berlin [u.a. ]: Springer. ISBN 3-540-41931-4. Stallings, William (2004). Operating Systems Internals and Design Principles (fourth edition). Prentice Hall. ISBN 0-13-031999-6. This page was last edited on 25 March 2019, at 19:07 (UTC).